Scandic Brennemoen is one of the largest conference hotels in the Ostfold region. Our hotel is located only 45 minutes from Oslo by car, and has excellent bus and train connections. The express bus from Oslo to Mysen stops at the hotel. We can organise everything from small daytime meetings to larger conferences and kick offs. ​Our​ hotel offers 100 stylish and newly decorated rooms with space for over 200 people. We have a modern fitness room that all our guests can use free of charge. Our hotel has large outdoor spaces near the forest where you can enjoy many exciting activities. There’ll be a large climbing tower by the hotel, which can be used for activities. Large outdoor parking area with several charging stations for electric cars. Our hotel offers a range of outdoor activities. You can organise team-building activities, nature trails, barbecues etc. There’s room for a large tent in our parking area. Right outside our hotel you’ll find many parking spaces, including parking for electric cars. Our hotel is located 10 minutes from the Ostfoldbadet water park. Our hotel is located 5 minutes from Momarken Travbane racing track, and 20 minutes by car from Rudskogen Motorsenter race circuit. Right next to our reception you’ll find our cosy and intimate restaurant, serving both lunch and dinner. Our facilities are perfect for parties such as confirmations, memorials and different anniversaries. Weather permitting, you can sit outside and enjoy a nice drink or something to eat. We have capacity for 160 conference guests at the same time. We have 7 meeting rooms. Our large, impressive public areas and meeting rooms make it easy for us to adapt to your needs when it comes to group work and social occasions. 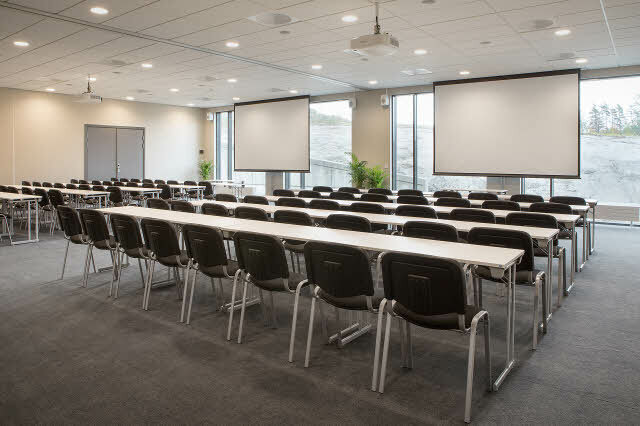 All our meeting rooms are equipped with state-of-the-art equipment.